There is opinion that short haircut looks the same. This is not true! Make elegant hairstyles for short hair, using our selection, which will give detailed instructions for each styling. Make parting on side. Collect hair from each side, folding them with strands. Pick up strands from behind, also twist and wrap them up. Fix hair with invisibility, forming wreath. Hairstyle fix with lacquer. If locks are knocked out don’t scary: they will add elegance. Comb your hair. Vertex’s strands sprinkle with varnish. After drying, scratch. At the back, fix mop of hair with invisible. Smooth them with comb. Pick up free lower locks. Gently lay them behind and secure them with invisible. If desired, fold scarf in form of strip and tie knot in front, hiding ends. Variant without scarf will fit into business style. Screw curls with ironing or curling for volume. Put on elastic band. On a circle twist strands of flagella and lay under elastic. Cover your hair with varnish. 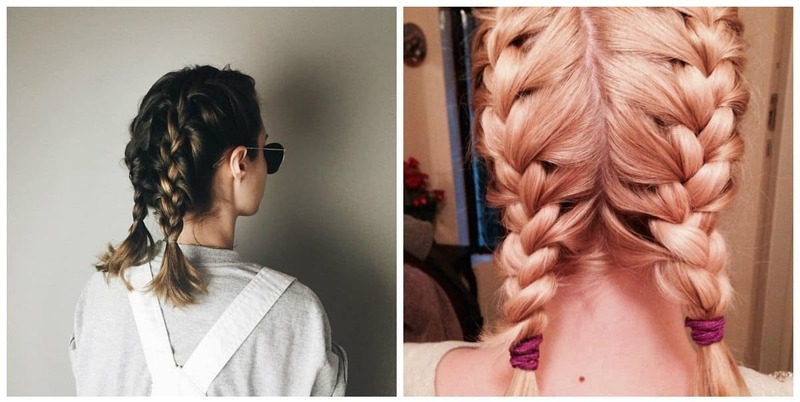 This hairstyle isn’t difficult, but it can dramatically change your appearance. Divide hair in middle or lateral parting. Braid braids on both parting sides to ear according to technology of spikelet. Firmly fix pigtails behind ears. Preheat iron or curling iron. Pinch upper locks. Start perming with back of head, twisting short locks. Long curls curl in different directions. Pull or flatten iron vertically. Twist bangs and fix hairdo with varnish. Curl is suitable for any hair length. It fits perfectly with evening gown. Lightly curl your hair to make look lush. Leave strands on sides, the rest gather in tail and make from it bunch on back of head. Free curls braid with French pigtails, laying strands under bottom. Connect pigtails above beam, hide tips and firmly fix studs. Hairstyle looks impressive, suitable for not too short hair. Separate part of strands from both sides. Embroider Dutch braids across head. Go to ears, don’t grab new strands. Relax braid curls for volume. Loose locks on back of head in tail-loop. Pair braids, cover them with loop and secure with invisible. Pit in middle, if desired, decorate with flower. Make parting on side or in middle. On right, twist fishtail from thin strands. On left, twist two thin French pigtails. Raise bunch of hair on crown and fasten underneath crossed pigtails with help of invisible. Lower upper curls and gently curl all loose hair. As a result, hair to shoulders looks quite different.